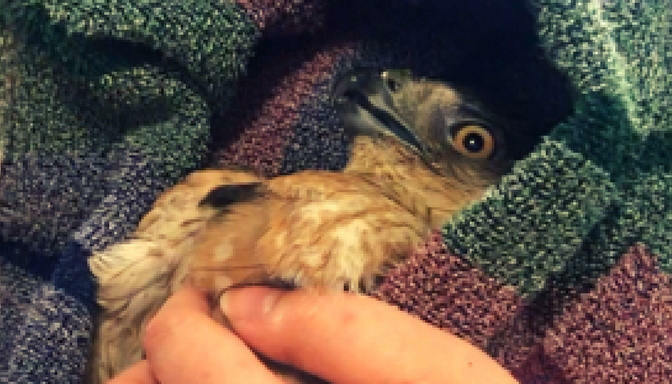 A Cooper’s Hawk was recently brought to New England Wildlife Center’s wildlife hospital where our veterinary team determined he had rodenticide poisoning. He is on his second round of treatment to remove the toxins from his body, and is receiving medicine and fluids to help manage the stress of captivity. The number of hawks, owls, and other birds of prey coming into the hospital with toxic levels of rodenticide in their systems is on the rise. Where there are people, there are very often also rodents like mice and rats. And to get rid of rodents, people often use rodenticides, also known as rat or mice poison. Birds of prey like the Cooper’s Hawk and other mammals ingest the poison when they eat a rodent with rodenticide in its system. The effects of rodenticides make rodents weak and slow-moving – and easier for predators to catch. Local food chains are increasingly contaminated with rodenticide through this pass-along effect. We get a lot of questions about rodenticide poisoning in birds of prey—which we’re happy to answer to help people learn more about how to protect wildlife! #1: What Does Rodenticide Do To Wildlife? Rodenticide works by blocking normal blood clotting, which leads to uncontrolled bleeding and hemorrhaging. Even minor cuts and scratches can be lethal. Internal hemorrhages weaken birds and make it more likely for them to crash into buildings, windows, and cars. Our vet team sees many wild patients that are brought into the hospital with head trauma or a broken wing caused by a crash, and discover they have rodenticide poisoning. #2: What Are Signs An Animal Has Rodenticide Poisoning? Rodenticide poisoning can be difficult to spot. Sometimes there can be signs of bleeding from the mouth, nose, or eyes. Sometimes you may be able to spot a large hematoma, which is a collection of blood outside the blood vessels – imagine a blood blister, but one with life-threatening consequences. Wild animals with toxic levels of rodenticide in their systems are weak, have difficulty moving, and are slow to respond to human approach. As rodents have developed a tolerance for existing rodenticides, new ones have become available with poisons that are more difficult to clear from an animal’s system and more toxic to predators. At the wildlife hospital, our vet team treats rodenticide poisoning with Vitamin K to restore blood clotting, as well as provides other supportive care. The treatment can last for several weeks or even months. #3: What Can The Public Do To Help? Stop using rodenticides. Many environmentally safe rodent control alternatives are on the market today that do not adversely affect the birds of prey or large mammals. When you use alternatives to rodenticides, you help decrease contamination of the wild food chain. Want to Learn More About Wildlife? New England Wildlife Center is open to the public, 10 am – 4 pm, 7 days a week, all year long. You can look through the observation windows at our wildlife hospital to see animals receiving care. You can also learn about local habitats in our Weezie Nature Center and by walking along our outdoor nature trails. And to get the latest updates on wildlife receiving care at NEWC and other educational information, subscribe to our Wild Update email list.